As you sit and stare at a blank screen, trying to come up with an introductory paragraph, it can be difficult to recognize the true power of the essay. Essays are tools that we can use to shed light on situations that are intimate to us, situations that our own personal experience can hopefully bring enlightenment and meaning to someone else. There is an incredible amount of power that can be wrapped up in the thousand plus words of an essay. This method of reaching others has become increasingly popular with celebrities, especially female celebrities who have chosen to use the power of their voice to bring attention to the many facets of feminism and gender equality that woman come face to face with every day. When discussing feminism and gender equality, it is important to realize that this is not just one issue, but actually many issues bundled up together. These powerful female voices take on the task of bringing to light some of these issues through the use of essays and personal narratives. 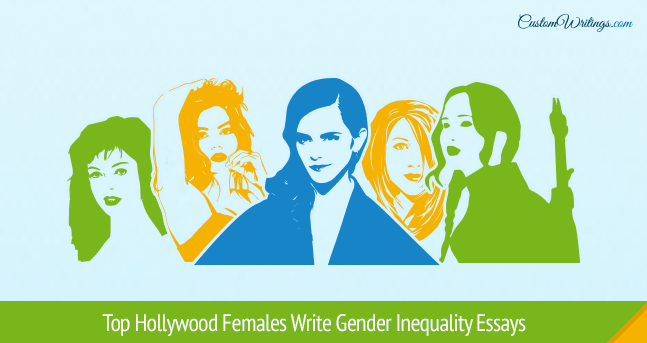 Here are some of the most recent, powerful essays on gender equality writing by top Hollywood females. In this essay, Mila Kunis shares her experience of having her livelihood, her reputation and her dreams destroyed at the hands of a producer who was willing to compromise her career simply because she did not wish to expose her body for a movie promotion. What is powerful about this essay is that it does not focus on just this incident, but rather uses it as a springboard for a discussion about the inequalities and dangers that all women face in the workplace, regardless of the type of job they have, or how much money they make. At the end of the essay Mila states how she recognizes that she is fortunate to be able to stop compromising, without fear of not being able to put food on the table. She also recognizes that she is fortunate to have a platform from which to speak and be heard in order to encourage and empower other women. Some of the most important essays are the ones that take personal views and perspective and use them to encourage others to make changes for the better. In Emma Watson’s essay/letter, she uses the fact that she is a recognizable figure to encourage women to understand the value of their personal power and to use that power to vote for governmental leaders who place the most value on treating all citizens as equal. Furthermore, she appeals to those who may not necessarily feel that these issues are important by making note of the ripple effect, in which what affects one of us, eventually affects us all. In this essay, Jennifer Aniston articulates beautifully her journey as a woman who has spent many years in the spotlight, under public scrutiny. The essay starts out by introducing the most recent issue at hand, and then takes that and builds into an expertly crafted essay on how she has become a lens through which we view all women. The essay speaks on important feminist issue including the perception of what makes a woman feel fulfilled and how every aspect of a woman appearance is judged. This essay is powerful because she speaks with various tones of authority, personal experience, frustration and disgust, all while being relatable to the audience. Jennifer Lawrence: Why Do I Make Less than My Male Costars? Pay inequality has is a long-standing gender issue, and in this essay, Jennifer Lawrence questions why that still is and in the process, has us asking ourselves the same questions. In essence, she asks women why they are worried about not being liked when asking for what they want or need. She makes causes the female readers to ask themselves if they too act nice for the sake of not offending male coworkers. Rather than addressing the pay discrepancy issue with facts and statistics, this essay approaches the issue on a personal and emotional level. Sometimes, an essay skips the niceties and set-up and sets forth to drive the point straight home. In this essay, Rose McGowan specifically address an 80s television star that shared a meme in which a derogatory term is associated with then presidential candidate Hilary Clinton. While the letter is target toward this instance, she turns it to point out a concept that she coins as “male terror”. This essay is not eloquent, but rather raw in its approach to this feminist issue. Celebrities have lives that we either envy or despise. However, when they speak, the masses listen. The most powerful celebrity essays allow the reader to see the ways our lives are the same, rather than how they are different. This is one way of connecting to the audience through an essay. In this case, these women all recognized that they endure the same unbalanced judgements and treatments that women all over the world experience, except that they have a voice loud enough to be heard.